Who gets what water in Arusha? Arusha is officially a small city of over 400,000 people (according to official census) but urban authorities believe this to be vastly underestimated and the number could be over 700,000. As part of my research on urban water supply, I visited some of the most unplanned and low-income parts of Arusha city where there is a large population growth, as these low income areas house many recent migrants and offer the most affordable housing, and lowest land prices. Continue reading Who gets what water in Arusha? 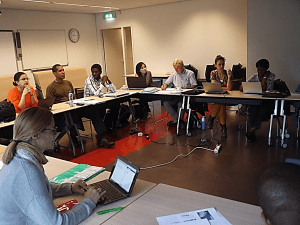 From 1-3 September, the T-GroUP kick off workshop took place at UNESCO-IHE in Delft. The main purpose of the workshop was to get to know each other, to learn more about Transition Management and Learning Alliances, to discuss data collection programs, to identify overlaps and differences between the three focal areas in Ghana, Uganda, and Tanzania, and to detail individual year plans of each team member. T-GroUP: A Visit to Dodowa! Dr. Jan-Willem Foppen visited Dodowa from 22 to 29 of July. In his visit, Jan Willem met with Dr. George Lutterodt from Central University College (CUC) in Accra, who heads the Local Transition Team (LTT). Together with Dr. Sampson Oduro-Kwarteng from Kwame Nkrumah University of Science and Technology (KNUST), who is also part of the LTT, they visited Dodowa, met with local leaders, invited local consultancy firms and drilling firms, and discussed project phases. Also, the Ghana Atomic Energy Commission and the Ghanata Senior High School, two of the associated partners in the project, were visited.